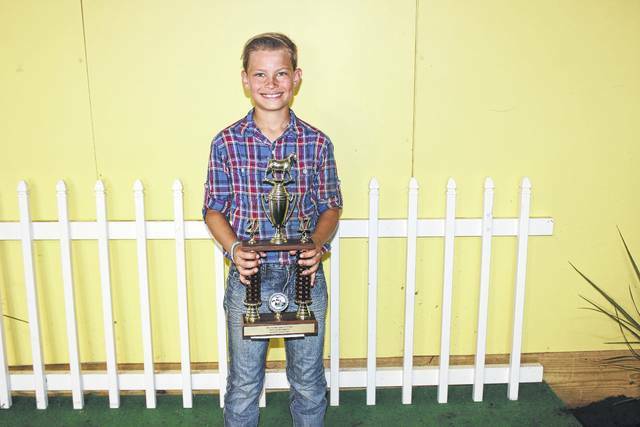 Austin Etzler won the overall meat goat showman award at Tuesday’s Fayette County Junior Fair Meat Goat Show. He is pictured with Meat Goat Ambassador Cheyenne Williams. Corbin Melvin won the beginner meat goat showmanship class at Tuesday’s Fayette County Junior Fair Meat Goat Showmanship contest. Victoria Schappacher won the novice meat goat showmanship class at Tuesday’s Fayette County Junior Fair Meat Goat Showmanship contest. 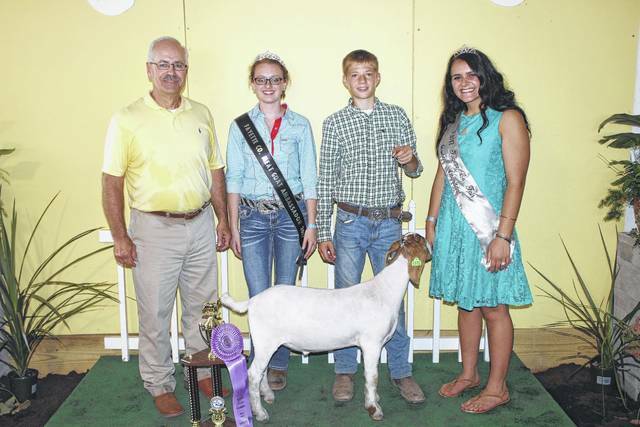 Abigail Mick won meat goat grand champion at Tuesday’s Fayette County Junior Fair Meat Goat Show. Mick is pictured with Meat Goat Ambassador Cheyenne Williams and Fair Attendant Susanna Eckstein. 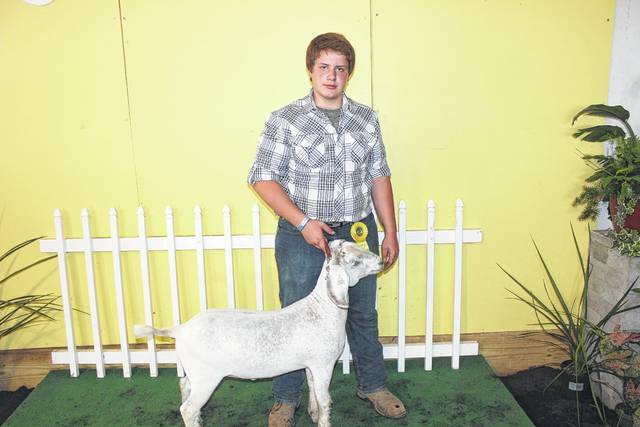 Austin Etzler won meat goat reserve champion at Tuesday’s Fayette County Junior Fair Meat Goat Show. Etzler is pictured with the judge of the show, Doug Bayliss, Meat Goat Ambassador Cheyenne Williams and Fair Attendant Susanna Eckstein. 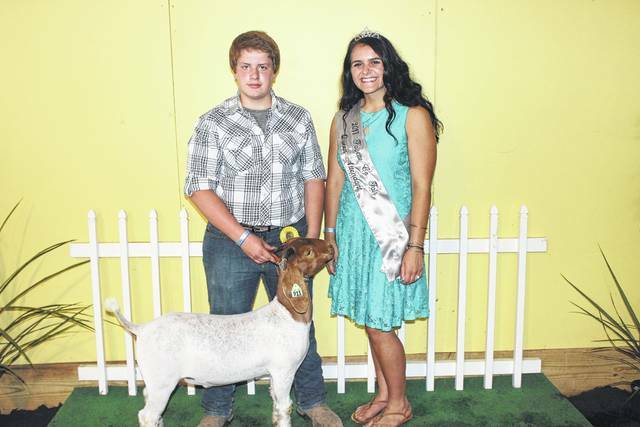 Third place overall in Tuesday’s Fayette County Junior Fair Meat Goat Show went to Drew Pontious, who is pictured with Fair Attendant Susanna Eckstein. 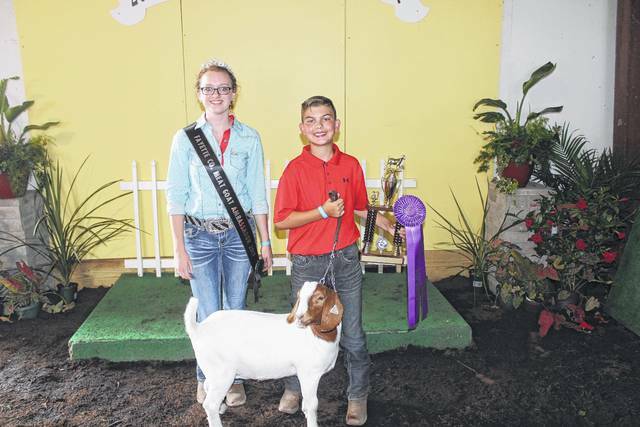 Fourth place overall in Tuesday’s Fayette County Junior Fair Meat Goat Show went to Parker Ellison, who is pictured with Fair Attendant Susanna Eckstein. 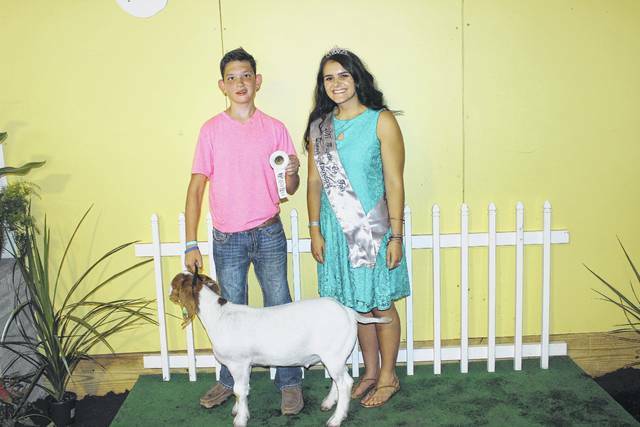 Fifth place overall in Tuesday’s Fayette County Junior Fair Meat Goat Show went to Corbin Melvin, who is pictured with Fair Attendant Susanna Eckstein. 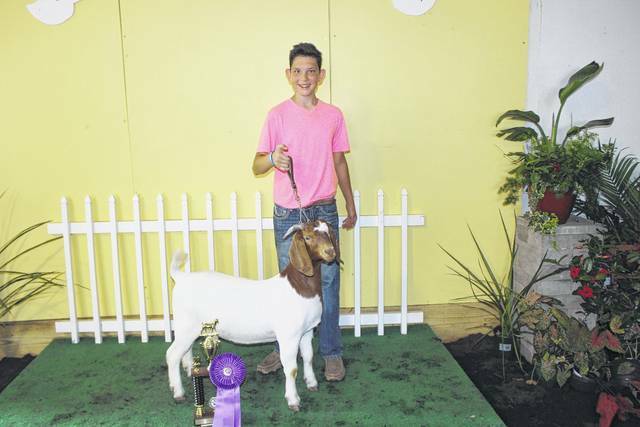 Parker Ellison won the Performance Class Championship at Tuesday’s Fayette County Junior Fair Goat Show. The performance class measures the combination of live placing, sonogram, and rate of gain. Forty-eight goat exhibitors participated in the class this year. The competition began on May 7 with the goat weigh-in. Drew Pontious won champion Fullblood Boer Doe at Tuesday’s Fayette County Junior Fair Breed Goat Show. Connor Collins won champion Percentage Doe at Tuesday’s Fayette County Junior Fair Breed Goat Show. Collins is pictured with Meat Goat Ambassador Cheyenne Williams. Callie Cockerill won reserve in the Performance Class at Tuesday’s Fayette County Junior Fair Goat Show. https://www.recordherald.com/wp-content/uploads/sites/27/2017/07/web1_IMG_9300.jpgAustin Etzler won the overall meat goat showman award at Tuesday’s Fayette County Junior Fair Meat Goat Show. He is pictured with Meat Goat Ambassador Cheyenne Williams. https://www.recordherald.com/wp-content/uploads/sites/27/2017/07/web1_IMG_9303.jpgCorbin Melvin won the beginner meat goat showmanship class at Tuesday’s Fayette County Junior Fair Meat Goat Showmanship contest. 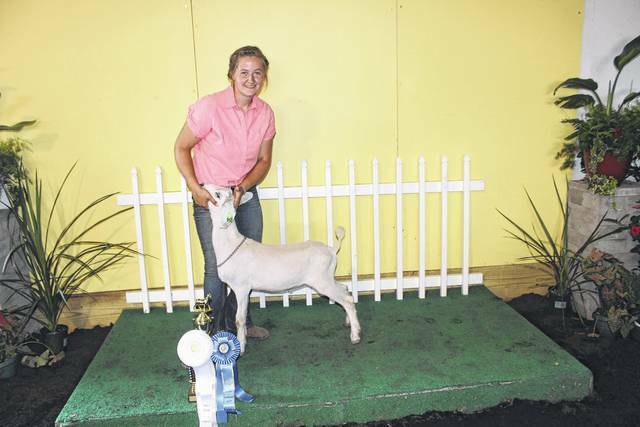 https://www.recordherald.com/wp-content/uploads/sites/27/2017/07/web1_IMG_9305.jpgVictoria Schappacher won the novice meat goat showmanship class at Tuesday’s Fayette County Junior Fair Meat Goat Showmanship contest. https://www.recordherald.com/wp-content/uploads/sites/27/2017/07/web1_IMG_9307.jpgAbigail Mick won meat goat grand champion at Tuesday’s Fayette County Junior Fair Meat Goat Show. Mick is pictured with Meat Goat Ambassador Cheyenne Williams and Fair Attendant Susanna Eckstein. 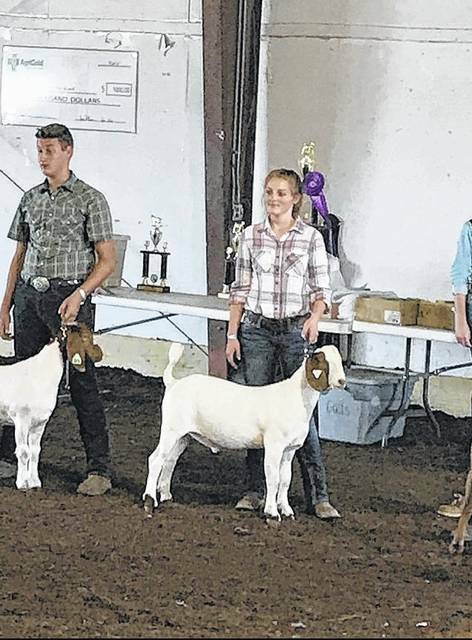 https://www.recordherald.com/wp-content/uploads/sites/27/2017/07/web1_IMG_9308.jpgAustin Etzler won meat goat reserve champion at Tuesday’s Fayette County Junior Fair Meat Goat Show. Etzler is pictured with the judge of the show, Doug Bayliss, Meat Goat Ambassador Cheyenne Williams and Fair Attendant Susanna Eckstein. https://www.recordherald.com/wp-content/uploads/sites/27/2017/07/web1_IMG_9311.jpgThird place overall in Tuesday’s Fayette County Junior Fair Meat Goat Show went to Drew Pontious, who is pictured with Fair Attendant Susanna Eckstein. https://www.recordherald.com/wp-content/uploads/sites/27/2017/07/web1_IMG_9313.jpgFourth place overall in Tuesday’s Fayette County Junior Fair Meat Goat Show went to Parker Ellison, who is pictured with Fair Attendant Susanna Eckstein. 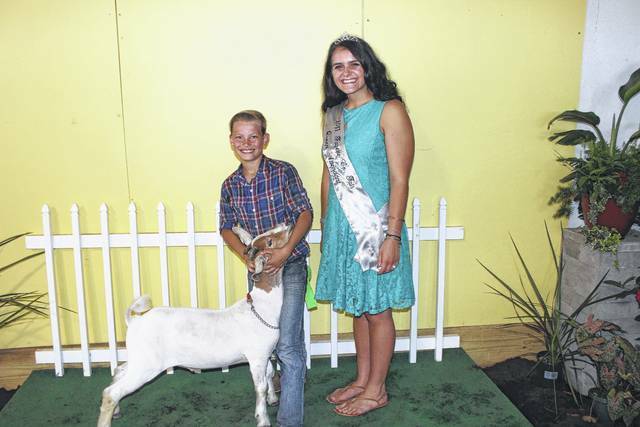 https://www.recordherald.com/wp-content/uploads/sites/27/2017/07/web1_IMG_9315.jpgFifth place overall in Tuesday’s Fayette County Junior Fair Meat Goat Show went to Corbin Melvin, who is pictured with Fair Attendant Susanna Eckstein. 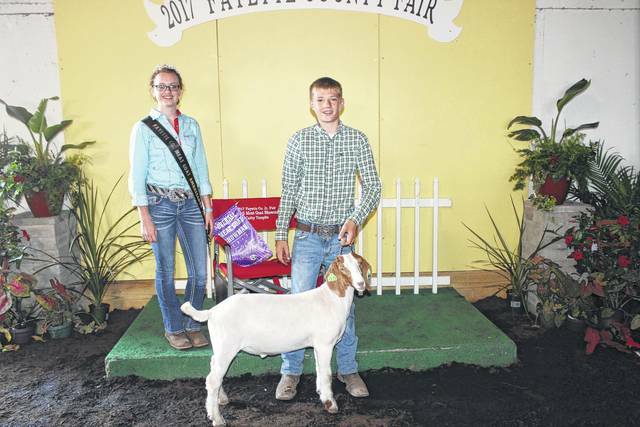 https://www.recordherald.com/wp-content/uploads/sites/27/2017/07/web1_IMG_9318.jpgParker Ellison won the Performance Class Championship at Tuesday’s Fayette County Junior Fair Goat Show. The performance class measures the combination of live placing, sonogram, and rate of gain. Forty-eight goat exhibitors participated in the class this year. The competition began on May 7 with the goat weigh-in. https://www.recordherald.com/wp-content/uploads/sites/27/2017/07/web1_IMG_9319.jpgDrew Pontious won champion Fullblood Boer Doe at Tuesday’s Fayette County Junior Fair Breed Goat Show. https://www.recordherald.com/wp-content/uploads/sites/27/2017/07/web1_IMG_9321.jpgConnor Collins won champion Percentage Doe at Tuesday’s Fayette County Junior Fair Breed Goat Show. Collins is pictured with Meat Goat Ambassador Cheyenne Williams. 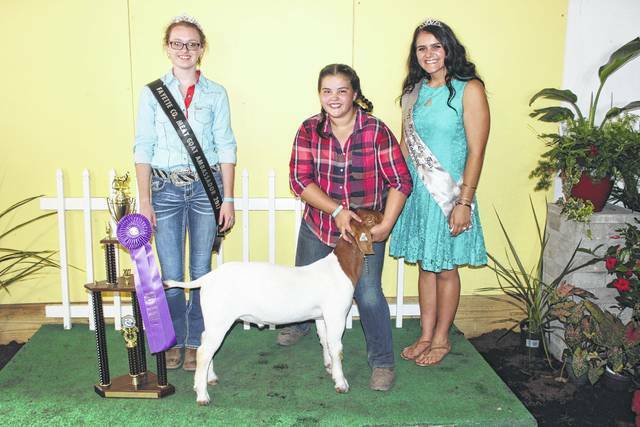 https://www.recordherald.com/wp-content/uploads/sites/27/2017/07/web1_IMG956056.jpgCallie Cockerill won reserve in the Performance Class at Tuesday’s Fayette County Junior Fair Goat Show.